Spain has a reasonable but constantly improving telephone system provided by Telefonica which is now the same company as Movistar, who are not the easiest company to get on with. There are now new companies that offer similar services in competition and these should be examined, especially if you are looking for broadband in Spain. You will usually find a telephone in your hotel but failing this, most bars and restaurants have a public telephone. 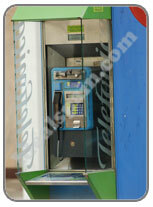 There are telephone cabins on the streets, managed by Telefonica. Most of these have a facility for instructions in other langauages by pressing the language button. There are also an ever increasing number of commercial call cabins that offer cut price calls abroad. The public phones in the street work well and accept most euro coins. You can also purchase phone cards from tobacconists for use in card phones. Another option is purchasing prepaid mobile phones that can be used internationally so you can have a phone with you at all times. Telephones in the streets are called cabinas. The ringing tone is long, the engaged tone shorter and rapid. Pick up the receiver, insert a coin then wait for a dial tone. You are then free to insert more coins and dial your number. Remember, with international calls it will cost you over 60 cents just to get through and you will need a plentiful supply of coins. Make your first coin a small 10 cents for example until you know the phone is working. Also remember that it is better to use small coins as when you terminate your call, the phone will only return whole unused coins. International and national calls are cheaper after 10pm on weekdays, 2pm on Saturdays and all day Sunday. Spanish numbers consist of nine digits, the first three being the area code (see below). Dial 00 for an international call, then 34 which is the code for Spain, then the subscriber's number, including the area code. See our table of international codes. You cannot make reverse charge calls from a call box, nor receive calls. In tourist areas you will find phone shops where you can pay for your call when you finish. Bars also have telephones but most make a surcharge. Restrict your calls from your hotel as the charge is often trebled. If you move to Spain and have a land-line installed by Telefonica, the installation time will vary. In cities and built-up areas the service is good and can be a few days, in remote areas where there are no telegraph poles, you may wait years and if you do get a land-line, it may cost a considerable amount of money. Telefonica may insist that several residents in the area apply for a line before they will consider you. In some areas, ADSL internet lines are not available yet. Once you have a line installed, you will find Telefonica's service to be adequate but often frustrating. They have a few staff that speak English and are very helpful. Dial 1004 from your phone to get assistance. You can also, through this service, record your own message. Access the answerphone service then follow the menu which will of course now be in your own language. To obtain a land-line with Telefonica (Movistar) you will need to call at a shop that retails phone contracts and present your bank details along with your passport or NIE number or call 1004 from a landline. Installation costs around 170€ and will be taken direct from your bank account. Bills are sent to you monthly(ish) and then two weeks later the amount is deducted from your bank. You can however pay the bill at the bank beforehand if you wish. Take the bill with you and pay in cash.